First, we need to define which groups to charge different recurring amounts and when. Before diving in it is important to understand the distinction and relationships of different groups. Billing Groups define different groups of athletes you will bill recurring amounts in the billing system. If you'd like to track the income of each group, it's important to create them individually even if they're being charged the same amounts. If using online registration, you may wish to use the same naming convention as your Roster and Registration Groups. You can email selected Billing Groups from the Email Center, from Account/Member Admin, from Invoices & Payments, and when creating events. Sub Billing Groups define when and what to charge recurring amounts to Billing Groups. Each Sub Billing Group you define will appear for every Billing Group. If you define “Full Payment” and “Monthly Payment” Sub Billing Groups, then Bronze, Silver and Gold Billing Groups will all have Full Payment and Monthly Payment Sub Billing Groups. Roster Groups and Locations have nothing to do with billing, but Billing Groups often mirror the Roster Groups if you want to track the income of each Roster Group. Both are optional. Some teams organize by Billing Groups only. They are used when taking attendance in OnDeck, TeamUnify’s mobile app. You can email selected Roster Groups and Locations from the Email Center, from Account/Member Admin, from Invoices & Payments, and when creating events. Registration Groups allow people registering to choose in which group to register each athlete. They only appear in Registration Admin and can have age limits and a description. They are NOT Billing Groups, nor are they Roster Groups. They only appear in teams using our Online Registration system. Read more about Registration Groups in TU University. Payment Options allow people registering to choose payment frequencies. They only appear in Registration Admin and are tied to Registration Groups. They are NOT Sub Billing Groups, but they will most likely match at least some of your Sub Billing Groups. Read more about Payment Options Setup in TU University. For all of the above groups, athletes can only belong to ONE of each at a time. For instance, an athlete could not be in both a Bronze and Silver Roster Group simultaneously. The general flow looks like this. Family registers an athlete and chooses a Registration Group, Location, and Payment Option. Admin approves and assigns the athletes to a Billing and Roster Group based on the Registration Group, a Sub Billing Group based on the Payment Option and/or Registration Group, and a Location based on the Location. The system generates recurring fees based on Billing and Sub Billing Group. As we give instructions for each area, we will use the scenario below as an example of how all these groups relate to each other. This is a moderately complex billing setup but SwimOffice can easily handle it. Let’s begin. We want to track the income for all three groups, along with the resident and non-resident rates. We could set up CoAs that look like below, and we will do so in the next lesson. Here you define the groups to charge recurring fees. If you charge all groups the same amount, you could have a single Billing Group called “Swim Team.” But you will likely have more than that, especially if you want to track the income for each group. This is why Billing Groups usually mirror Roster Groups. 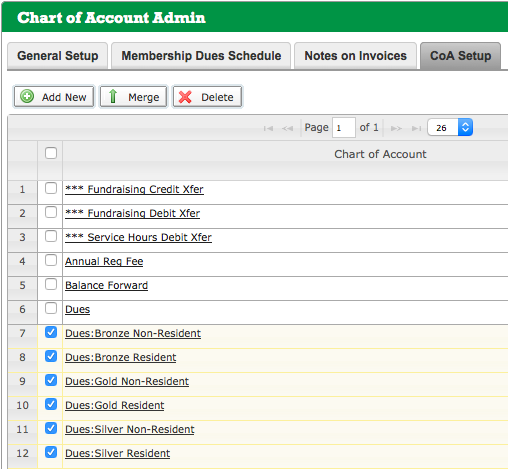 Note that if you change a Billing Group you will see those changes reflected everywhere it is used, such as Account/Member Admin. In the side navigation click Billing Admin > Billing Setup. 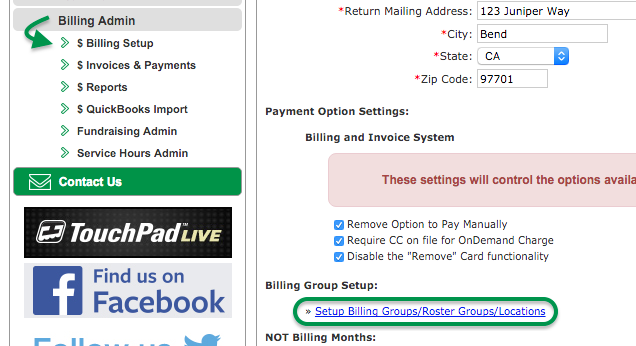 Below “Billing Group Setup” click Setup Billing Groups/Roster Groups/Locations. In the “Setup Team/Billing Group” window that opens click Add New. You will usually leave “Free Membership for this Group?” set to No. Only set it to Yes if you want a Billing Group with no recurring fees at all, including Additional Per Account/Member Charges. For example, Coaches and Board Members that are already set up, or perhaps “Staff Kids” who are free. Note that free groups do not show in the Membership Dues Schedule at all. In our scenario, all we need here are the three groups. While we could have separate groups for resident and nonresident, we will handle those in the Sub Billing Groups instead. Next, we set up groups that determine what months to generate recurring fees for all the Billing Groups. They are useful for different payment plans such as monthly or annual, and for different seasonal plans, such as year-round and summer. They are duplicated in each Billing Group, even though you may not need every option for every Billing Group. In our scenario, we create Full Payment and Monthly Payment options for both residents and non-residents. Even though we collect the full payment during registration, we still need to select one month in which to bill, but we will later set the amount to $0 since they pay when they register. If you just set up your Billing Groups, skip to step 3. Click Sub Billing Group tab. Enter the “Sub Billing Group Name,” such as Full Payment - Resident. Check the months this Sub Billing Group will generate recurring fees. In the case of a Full Payment group where you collect the full amount during registration, you still must select a month, but don’t worry, we’ll set the amount to $0 later. If you don’t use our registration system, then set the month to the one where you charge the full amount annually. As previously mentioned, Roster Groups do not affect billing in any way. They are mainly used for organization purposes, such as taking attendance in OnDeck and emailing. Resident and nonresident status do not matter in our scenario, so we will keep them basic. If you just set up your Sub Billing Groups, skip steps 1-2. For “Type of Roster Group” you will typically leave it as Membership & Calendar. Membership refers to the page accessible by the Members link at the very top of your site that non-admins can search. Selecting Calendar Only will exclude this group as a selection in the Roster Group filter on the Members page, although members of the group can still appear in a general search. Calendar is for the Team Calendar page. Selecting Membership Only will exclude this group as a selection in the “Pick a Calendar” filter on the Calendar page. These do not affect billing either; however, they can be used for different pricing options in Registration Setup. They are used when taking attendance in OnDeck. Most teams will only have one location. For those with multiple locations, remember that an athlete cannot belong to more than one Location at once. If they float among different locations and don’t permanently belong to any single place then you may want just one generic Location. Otherwise, enter as many as you need. Nothing tricky here for our example. Congratulations on completing your Groups! Now it’s time to build your Chart of Accounts.